CORAL GABLES, Fla., October 1, 2018 /3BL Media/ - Bacardi U.S.A., Inc., the United States import and distribution arm of one of the world's leading spirits and wine producers, was honored with a SmartWay® Excellence Award from the U.S. Environmental Protection Agency (EPA) as an industry leader in freight supply chain environmental performance and energy efficiency in transportation logistics. The SmartWay Excellence Award is the EPA’s highest recognition for demonstrated leadership for Shippers and Carriers. For the third time in four years, the EPA has recognized top environmental performance by Bacardi USA in demonstrating a series of coordinated measures to effectively integrate its supply chain planning, operations, and transportation partners to effectively reduce its carbon footprint and emissions. Bacardi’s transportation efficiencies have significantly improved over the past few years. In 2009, 65% of Bacardi shipments out of its Jacksonville, Florida, bottling facility were with over the road carriers. In just nine years, Bacardi reversed that with just 35% of shipments traveling over the road, and now 65% moving via intermodal rail. These intermodal efficiency wins were further enhanced with Bacardi’s metrics-driven load planning, transportation and yard management systems designed to optimize the trailer “drop and pick” and full trailer moves. 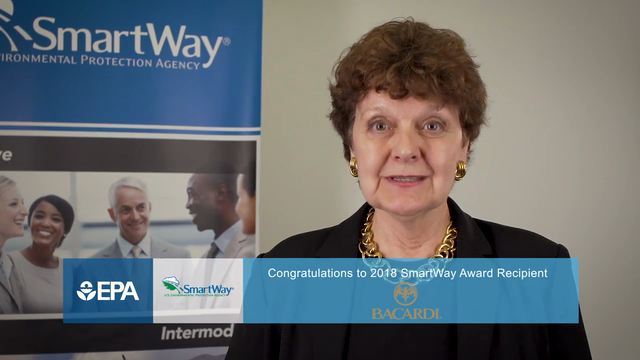 Bacardi USA was one of 14 companies to receive this distinction, representing the best environmental performers of SmartWay’s nearly 3,700 partners. The shipper and logistics Excellence Awardees were honored today at the annual Council of Supply Chain Management Professionals (CSCMP) Conference held in Nashville, Tennessee. Bacardi partners with Ryder System, Inc. (NYSE:R) – well known for its sustainable logistics and supply-chain solutions. Ryder manages Bacardi’s outbound domestic shipments and has fully supported Bacardi USA’s environmental and sustainability efforts. Since 2008, Bacardi USA and Ryder have worked together to integrate SmartWay’s program into Bacardi’s Good Spirited corporate responsibility program and have successfully reduced carbon emissions by more than 20%. Over the past ten years, Bacardi has also reduced the weight of its packaging by more than 7% -- equivalent to taking 1,100 full truckloads off the road. Bacardi U.S.A. Inc. is the United States import and distribution arm of one of the world's leading spirits and wine producers. The company boasts a portfolio of some of the most recognized and top-selling spirits brands in the United States including BACARDÍ® rum, GREY GOOSE® vodka, DEWAR'S® Blended Scotch Whisky, BOMBAY SAPPHIRE® gin, CAZADORES® 100% blue agave tequila, MARTINI vermouth and sparkling wines, the world’s leading vermouth and the world's favorite Italian sparkling wines, and other leading and emerging brands. EPA’s SmartWay Transport Partnership is a market-driven initiative that empowers businesses to move goods in the cleanest, most energy-efficient way possible, while protecting public health and reducing air pollution. Demonstrating a commitment to corporate sustainability and social responsibility through SmartWay provides for a more competitive and sustainable business environment. Since 2004, SmartWay Partners have avoided emitting more than 103 million tons of air pollutants (NOx, PM, and CO2) contributing to cleaner air and healthier citizens, while saving more than 215.4 million barrels of oil and $29.7 billion in fuel costs – equivalent to eliminating the annual energy use of over 14 million homes.